In the two previous blogs I have been proceeding under the assumption that the standard ‘bottom-up’ theory is a bankrupt paradigm. (As a reminder, the standard theory says that agriculture came first and created conditions – production of ‘surplus’ – that made complex, large-scale societies possible, indeed, inevitable.) But so far I have only cited one counter-example, in which an expanded-scale society appeared before agriculture – Göbekli Tepe. And as a comment to the previous blog pointed out, there were societies within 100 km of Göbekli Tepe that had domesticated plants at the time when this impressive monument was built. No domesticated plants or animals were consumed at Göbekli Tepe, but still. One anomaly is not enough to bring down a paradigm. A single counter-example can be explained away in a variety of ways. So the question becomes, what is the general pattern? Does adoption of agriculture usually pre-date, or post-date an expansion of social scale from hundreds, perhaps a few thousand individuals, typifying hunter-gatherer societies, to tens of thousands and more? Eventually we will be able to answer this question with the help of the massive historical/archaeological database of cultural evolution that we are building (see these two posts for more details: here and here). But for now let’s look at another example that presents an even more striking challenge for the standard theory – the Poverty Point archaeological site located in northeastern Louisiana. People, who built massive earth mounds at Poverty Point between 1800 and 1350 BCE, were emphatically hunter-gatherers. Yet they constructed a huge Mound A, which required 240,000 cubic meters of soil to be carried from various nearby locations and piled to make a structure that covers 50,000 square meters at the base and rises to a height of 22 meters. For those of you who dislike metric measures (tsk, tsk), 240,000 cubic meters = 8 million basket loads of dirt, each weighing 55 pounds; and 22 meters = the height of a seven-story building. Tristram Kidder, one of the authors of a recent geomorphological study of the mound, estimates that 270,000 people-days were required to build the mound (see the Science Daily article). When archaeologists first realized that earthworks such as those found at Poverty Point (and a number of other locations in the Mississippian region) were built by populations of foragers, they naturally assumed that it was done by a small group of people putting a steady amount of labor over the long term – decades, perhaps even centuries. For example, a typical hunter-gatherer society of, say, 1000 individuals, of which 300 could work on the mound for perhaps 10 days a year, would require 90 years – a century – to pile enough earth to make Mound A (this begs the question of why they would bother to do it, more on this in the next blog). However, when Kidder together with Anthony Ortmann and other archaeologists excavated Mound A, they made a striking discovery. This is very interesting, but it has a remarkable implication for the speed with which the mound was built. 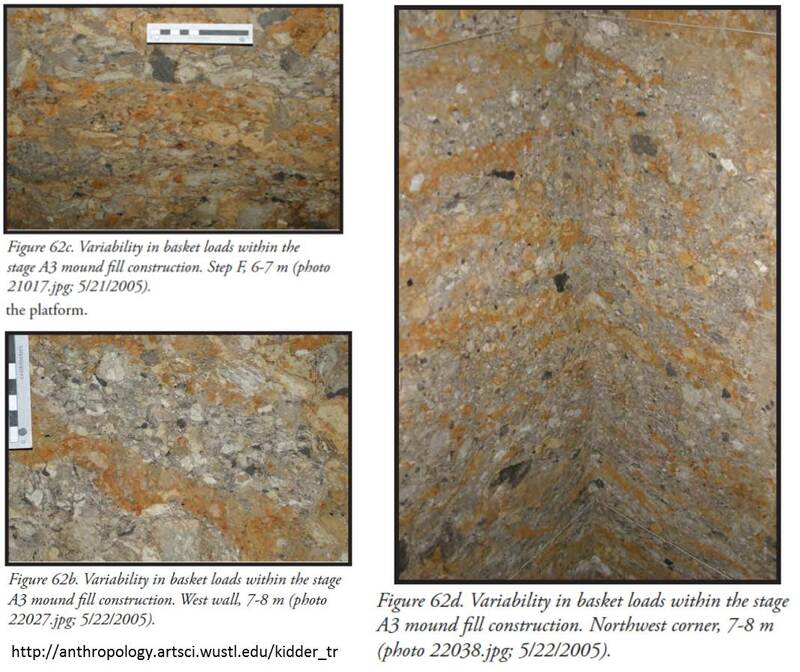 If at any time during the building process it rained, rainwater would flow through the top layers and mix them up, thus destroying the striation pattern observed on the vertical slice. Indeed, the top meter or so of the mound lacks the stripes, due to this process of erosion. However, there are no signs of weathering below the top meter and a half. The startling implication is that Mound A was built not over many years, but in one fell swoop. Kidder estimates that if the mound was built over 90 days, it would require 3,000 workers, which implies the overall scale of the society (adding women and children) of at least 9,000 people. Now, as one who lived in Louisiana for seven years, I must say I can’t imagine a dry rainless spell of three months (and there is no evidence of a massive drought during the period when the mound was built). Even having no rain for 30 days is pushing it, but let’s use it as a more realistic estimate than 90 days (by the way, I am not kicking Kidder and co-workers, they just had to be super-conservative when bucking the received wisdom that hunter-gatherers cannot cohere in large societies). Assuming a construction period of 30 days would require 9,000 workers and an overall society numbering in the tens of thousands. That’s a pretty remarkable social scale for a foraging group, and another nail in the coffin of the standard bottom-up theory. Archaeology inspires (and is itself inspired by) great wonder and imagination. 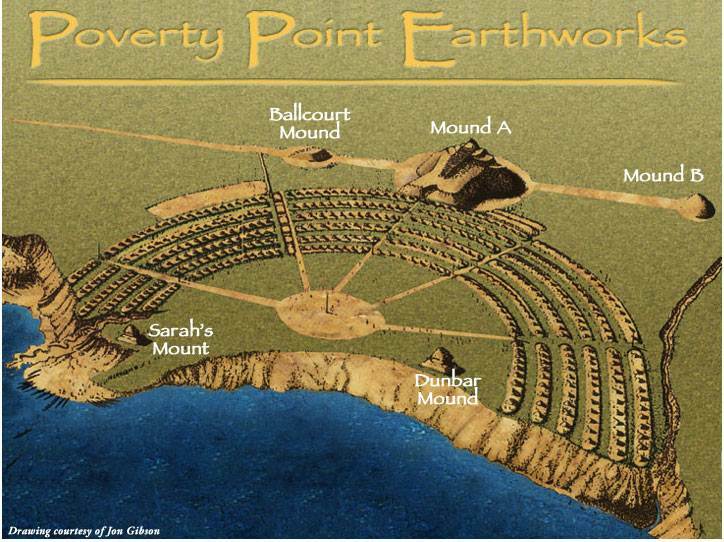 The ironically-named Poverty Point is anything but poor in the cliodynamic reveries it demands. I too know Louisiana well. Even a month of no rain would be very rare. During the 1933-40 drought across the U.S., Louisiana received normal and even excess rain. The long-term El Niño/La Niña cycles fluctuate excessively wet periods with “normal” rainfall, so this does not seem to allow long dry periods. What a month of work and celebration it must have been for the people during that mound-raising! What comes to mind is a a massive southeastern Burning Man-type of event. Some type of engineering and artistic oversight must have been required, possibly even collective art direction. Some image of the finished design existed in someone’s or some collective imagination. Even the hive-making genius of swarm-intelligent ants, which produces collective masterpieces of functionality, would never make a mound such as Mound A of such aesthetic elegance and placement, and with all accompanying, and still mysterious communal meaning. The raising of Mound A can maybe rank as the most liminal, non-coerced collective expression of the creation of meaning and aesthetic value maybe anywhere at anytime. The pyramid construction in Egypt was much less joyous, by all accounts, and exactly the opposite by being corvée and slave labor for no common benefit. Horace Smith’s version of Ozymandias needs a sequel after Poverty Point. Peter, you are the designated poet to sing the song of Poverty Point. Slavery is more of an agrarian institute, and ancient Egyptians definitely had slaves, but that doesn’t directly lead to the pyramids being entirely build by slaves. I’m curious as to what accounts you’re referring to? Maybe even most of the pyramid construction labor was forced and unpaid–corvée labor. This is not technically chattel slavery, but during the period of work, the difference between the distinction may have only been psychological and legal. The true slaves slaves of Egypt were war captives and subjugated people. The point is to make a distinction between the presumably unforced labor of the mound construction at Poverty Point, and the “megamachine,” using Mumford’s terminology, that built the Egyptian pyramids as monumentally egotistical pharaonic tombs. Maybe this is reading too much into the Poverty Point earthworks, but they seem more playful and communal. 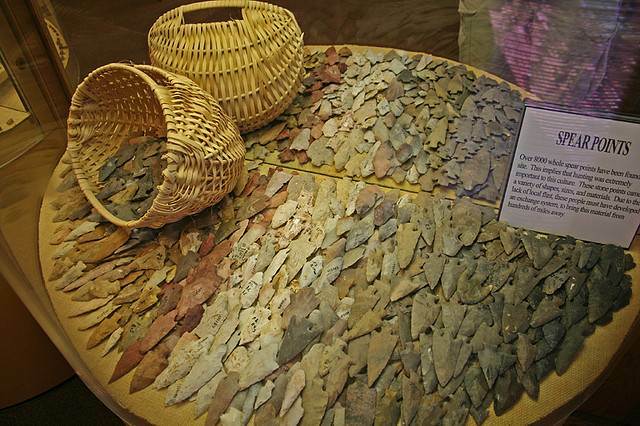 I think it was Poverty Point archaeologist Jon Gibson who suggested that the Poverty Point people and their ideas and vision may have been what was “traded” for all the exotic goods obtained far and wide that have been found at the site. Whatever was valuable for other people about Poverty Point was not material (since very little PP material was exchanged), but rather ideational. If followers or partisans of Poverty Point’s ideas helped build the big mound in world record time, I see a huge difference between this stunning event and gangs of forced workers toiling on an ego-bauble for a demented pharaoh. Thanks, Stephen, for your poetic comment! You are right, I forgot that Shelley wrote Ozymandias in competition with Horace Smith. Peter, I am curious about your opinion regarding the role of resource abundance and technology in both the Poverty Point and Gobekli Tepe sites (and other similar pre-agricultural sites), and the large scale cooperative efforts they required. Do you think increasing resource abundance and/or technological innovation played a role? By “technological innovation” I mean new and better methods and tools for hunting, gathering, processing, and storing food. It seems (at least to me) that without a source of predictable surplus––the guarantee that everyone’s belly would be filled, at least during the time they dedicated to the work of building the monuments––it would be difficult to enlist the required number of workers. Of course, if indeed the mounds were built in the short period the evidence indicates, seasonal abundance would obviously be sufficient for Poverty Point. But could that explain Gobekli Tepe? There is no question that technological innovation that leads to greater productivity plays an extremely important role. Here I am in complete agreement with the standard theory. The difference is in how we structure the causal arrows in our explanation. Rather than having the causation leading linearly from greater resources to greater social complexity, in my view there are feedback loops. So intense between-societies selection pushes for larger-scale (size) societies. To sustain large size, societies have to evolve to be more organizationally complex, to acquire mechanisms for creating and maitaining social glue, and to invent and implement more productive technology to generate sufficient resources for their functioning. 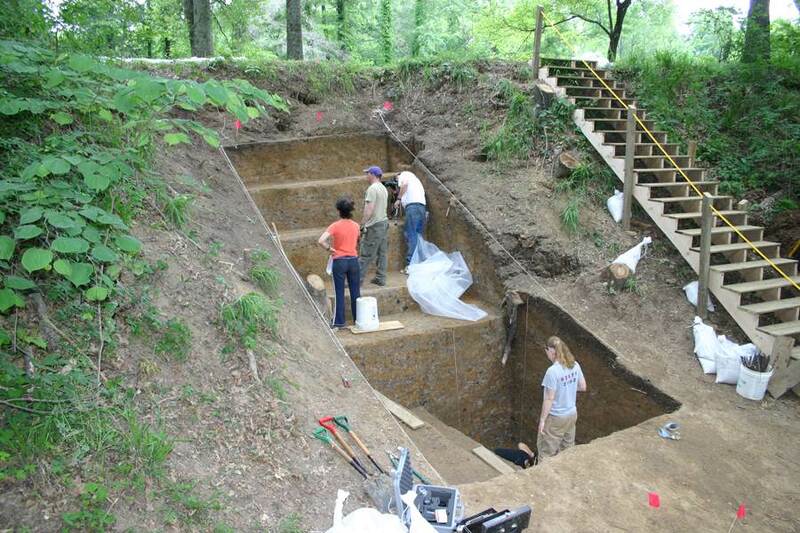 What about the other Indian mounds scattered throughout the Midwest and adjacent states? Were these the product of farmers or foragers? One way to think about the construction of these large scale “non-demographic” goods, like mounds, temples, pyramids and cathedrals is not in terms of resource/output surplus (which outside of Marxian analysis of industrial economies is a bit of a fuzzy concept) but rather labor surplus. I’m thinking of Arthur Lewis’ model from Development Economics. For a given level of land, resource density and productivity if you have a lot of people, at some point the marginal product of labor becomes zero. That marginal labor hour just doesn’t have any other factors of production to work with (this is usually captured by the so-called Leontief production function). If you add in Malthusian population growth then you wind up at a exactly such a level of labor, where a chunk of your workers are non-productive (to drop some more names, this is the same as the capital over accumulation that results in the Harrod-Domar model) And these are guys, or more precisely labor hours, just sitting around doing nothing but still consuming resources. So you might as well put them into production of some pyramids or mounds. Or better yet, send them off to wage war where they either loose and die, in which case they stop consuming resources, or they win and conquer you more land. Roughly, the amount of excess labor such an economy winds up with is proportional to the amount of land times the percent difference between maximum worker productivity that you’d get in a low density economy and the Malthusian, demographically determined level of resources per capita. So increases in both land and productivity result in more workers. But bringing in more land into cultivation is costly and if you live in a world that’s “filled up” then it can only be done at the expense of your neighbors. On the other hand a beneficial productivity shock – say due to climate change – will automatically get you more workers for building “cathedrals”, without affecting your level of demographically relevant good, “bread”. Note that this is true whether you have a “free worker” or “coerced labor” economy. One final note on productivity growth in hunter-gather vs. farmer economies. It works very differently. In hg economies productivity growth (a better spear or bow) enables you to extract more resources from your environment and at a faster rate. But you’re still constrained by the amount of resources that are there for you to hunt and gather. Such inventions can actually lead to resource depletion and collapse. The best that could happen is that you wind up with same resources per capita but more leisure. On the other hand, in agriculture, productivity growth takes the form of getting more crop out of given amount of seed. And humans have been very good at improving that ratio over time. Basically in hunter gatherer economies technological progress is necessarily limited and may even be undesirable. Agriculture makes ongoing technological progress possible and gives rise to continuous population growth. By the way, in agrarian societies technological progress is also limited and leads to Malthusian immiseration. What has to happen is for technological progress to accelerate to the point where it operates faster than demographic increase. This only happened 1-2 centuries ago. Even that has a limit – I personally don’t want to leave in a Soylent Green-type world. I’m not sure if it leads to immiseration. Destabilization maybe. Immiseration – a switch from one stable high resources per person equilibrium to another stable but low resources per person equilibrium. Destabilization – a switch from a stable (either low or high resource per person) equilibrium to an unstable one (usually high resources per person, a boom and bust cycle). It might be that we’re thinking of different “basic Malthusian model” here. Is there a sort of a “baseline” (formal) Malthusian model in ecology or anthropology (I’m familiar with Bruce Winterhalder’s work which is sort of my stand in for “how non-economists think about Malthus” but it may be that I focus on it precisely because it is very similar the economists’ view of Malthus)? Not sure this is a general rule, even in today’s world. The faster a group grows demographically, the poorer its members are, the more internal competition it will incur, and less asabiya it will have, eroding its ability to be successful in competition against other groups. Numbers is not everything. Unless a long drought was the spur? Unusual weather conditions or climate change as a precursor of religion – building a mound as the equivalent of throwing a virgin in a volcano? We have good climate proxies for the period – no sign of a prolonged drought, or any other unusual climatic condition. Yeah i was thinking more generally that if “wonderment at changes in the natural world” involved lots of fear that could get people very motivated over a short space of time. – a religious centre before a town *because* it was an important food/water source for a forager tribe and had to be defended?